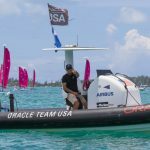 Teaming up with the AC Endeavour Program, Hobie brought youth sailors, from around the world to the America’s Cup for the adventure of a lifetime. 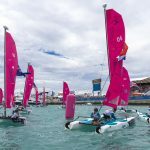 Hailing from eight different countries and ranging from 9 years old to 14 years old, these kids were hand selected to represent their hometowns and compete in the Hobie Junior Wave Regatta. 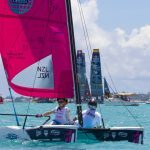 12 teams and 24 sailors later, they packed their gear and their dreams and jumped on a plane for Bermuda. 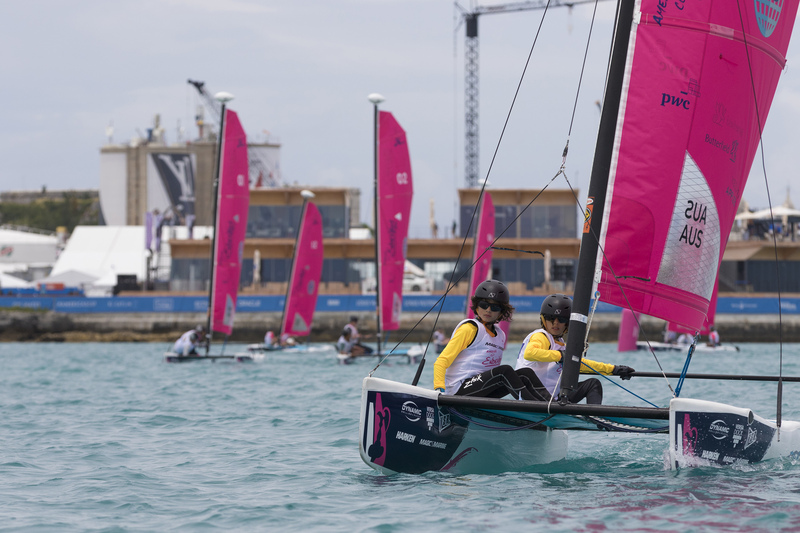 While having the opportunity to compete in the regatta of a lifetime was the main draw, these sailors quickly found that teamwork, making new friends, learning about other cultures and feeling the excitement of the world was more important. 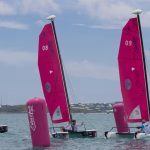 Day 1 in Bermuda found our teams, each Wave carrying a skipper and crew, with a Practice Day, adjusting to new waters, learning the subtle nuances between boats, and experimenting with different racing strategies. Conditions were light but the sunshine and warm water made up for it. 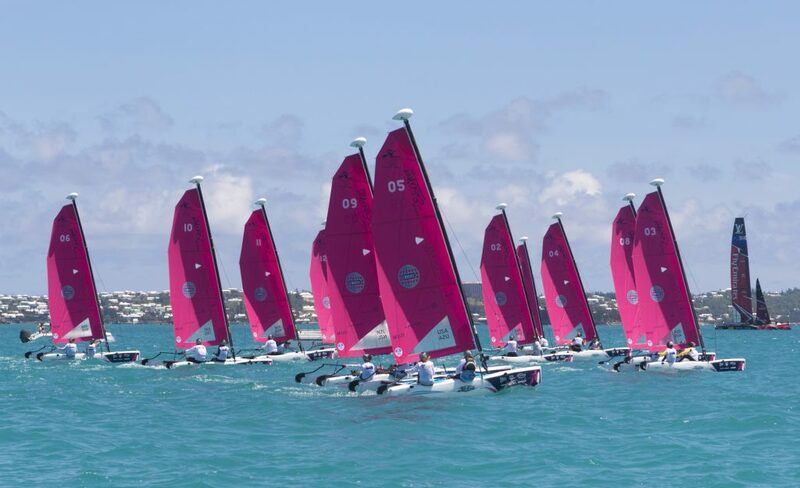 Day 2 kicked-off our regatta with our first day of racing. Breeze was on and soon after the Hobie Waves were flying across the water. 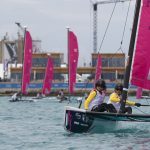 With a traditional catamaran style course, our sailors found their footings and were focused on the gold. 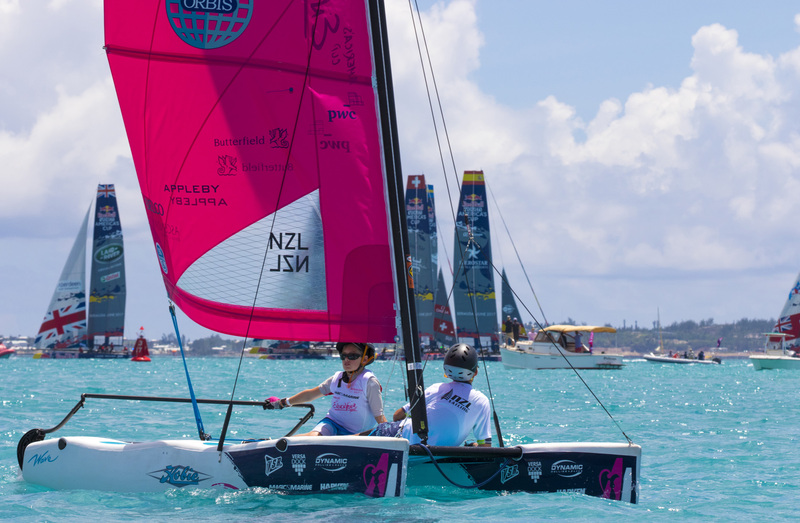 With seven races ahead of our sailors, the lead was open for the taking. 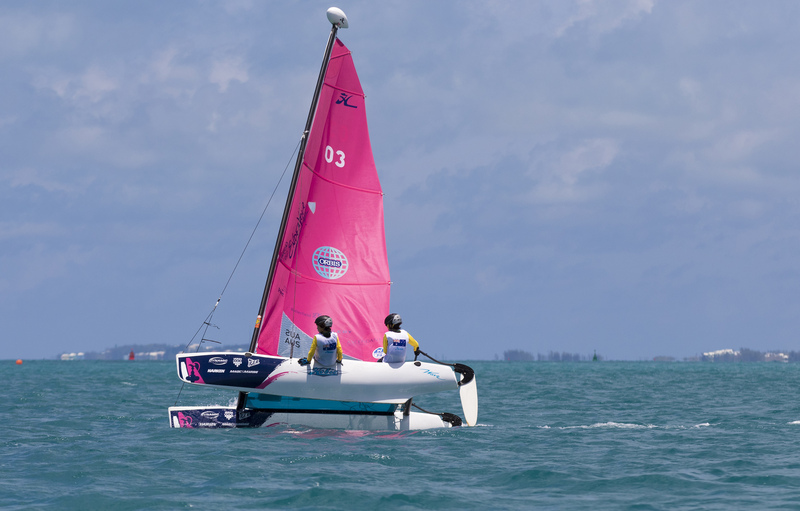 By the end of it though, Team USA (Samis and Barnard) leaped ahead and led the day with 2-1-1-1-2-1-1 finish. 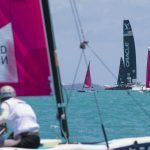 Day 3 found us racing with a course that closely mirrored that of the AC boats complete with a reaching start. 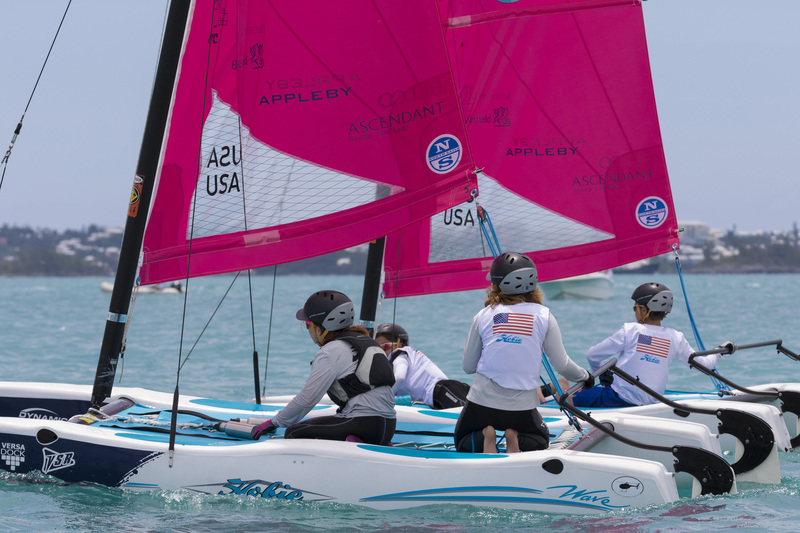 Barnard and Samis battled it out with the other Team USA, twin sisters Kimberly and Caroline Locke. 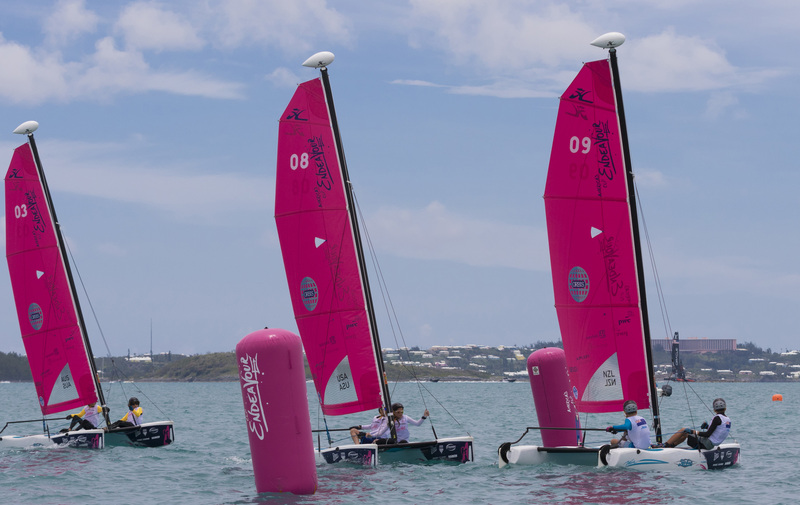 After five races, Samis and Barnard were able to secure the lead to place first overall. 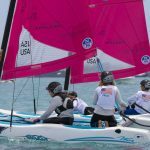 Team USA crew, Annie Samis (age 10) reflects on her team’s surprisingly successful days on the water. 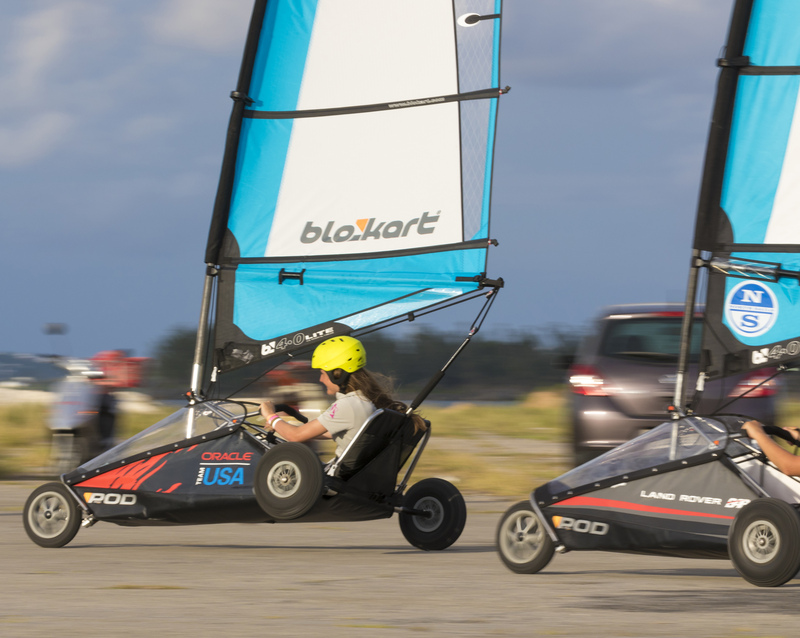 “Communication was really key for us. 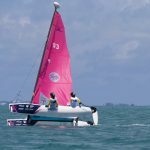 We were constantly talking about what would make us faster or what would make the boat perform better or worse.” In the end it paid off, Annie and skipper Peter Barnard (age 11) snagged the coveted number one spot, taking first place overall in the Hobie Junior Wave Regatta. 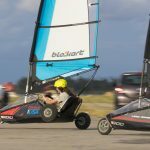 But it wasn’t all tactics and strategy, the kids were able to try blo-karting, enjoy an afternoon on the Spirit of Bermuda and tour the Red Bull Youth Camp. 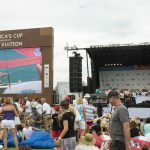 One of the pinnacle moments of the week though was the exhibition race and Half-time show in between Race 1 and Race 2 of the Day 3 Finals for the America’s Cup. 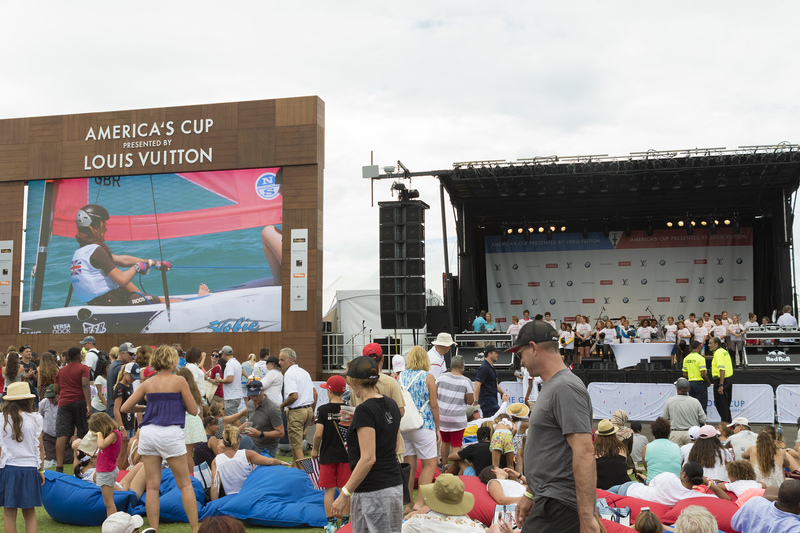 The Hobie sailors had the opportunity to strut their stuff in front of a packed house and the AC Grandstand. 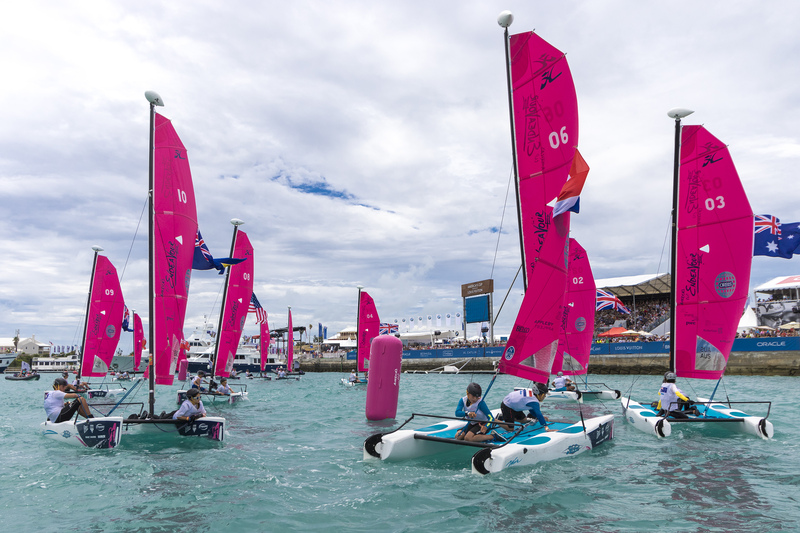 12 pink Wave sails dotted the course, as our 24 sailors experienced the thrill of a lifetime. 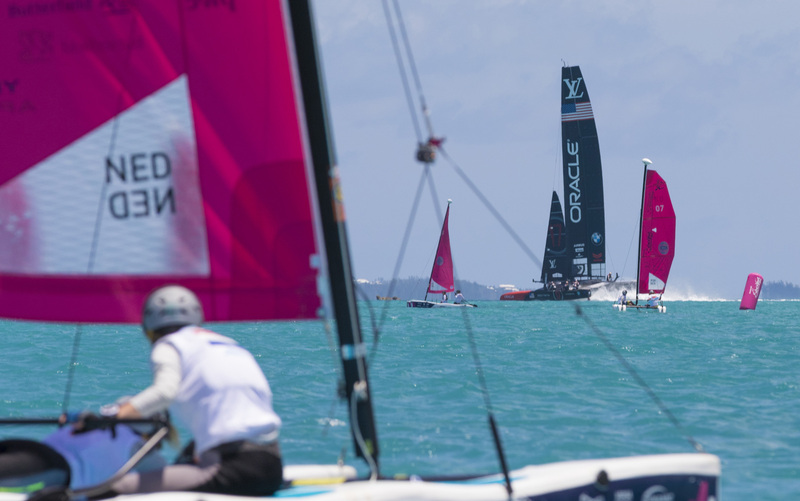 It wasn’t about winning the race as much as seizing the moment and breathing in all that is the America’s Cup. 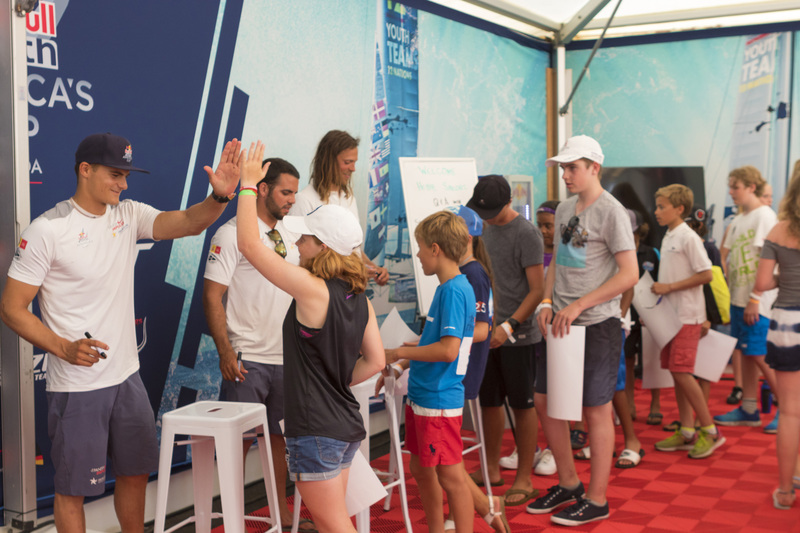 Creating new opportunities for kids around the world, fostering camaraderie and sportsmanship and inspiring a love for the water and sailing are the key elements of the AC Endeavour program. 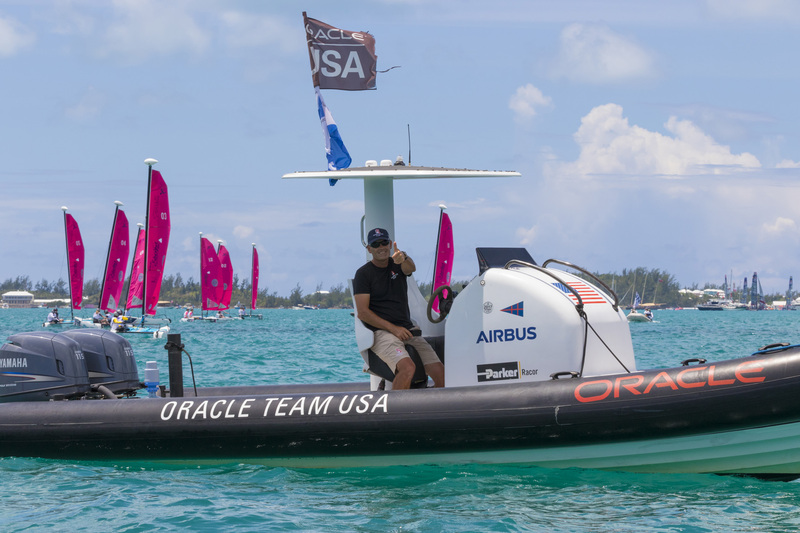 We at Hobie are proud to say this is what these sailors will walk away with when it comes time to leave Bermuda and what they will carry with them when they reflect on their time at the America’s Cup.